This how-to on Windows Salt minions will just scratch the surface of the power behind Salt, and will cover remote execution, installation and management. Please note: I’m new to Salt, and I’m a recovering Windows syasdamin from the 2000-2013 era. This means I probably have a bunch of out-moded ways of working with Windows. To this end, this first question would be: why? Active Directory and associated policies do a good job of managing Wintel already. I’ve had luck in the past managing hundreds, thousands of servers, desktops and laptops using the tools Microsoft provides without too much issue, and I’ve heard things only got better since I left for greener pastures. The easy answer is that many organisations may now find themselves with a combination of Linux and Windows servers, Windows and macOS workstations, coupled with the odd BSD system here and there, Linux desktops and Unix servers. What Salt allows for is a management platform that covers all of these platforms with a common language that is easy to read and hack away at (YAML) and very extensible using a programming language with a relatively gentle learning curve (Python). In my case, most things running at home are either running OSX or some version of Linux/BSD, but there are a few of oddball Windows 10 computers doing things Microsoft-based computers do pretty well; gaming, spreadsheets, touchscreen-enabled full-desktops. The idea of managing Windows computers with Salt came to me pretty late into the journey through the docs, but hit me like a freight-train as these are often the computers that require the most maintenance for me personally, meaning reinstalls, reconfiguration and general “care and feeding”. Having gone down the path of running my own Active Directory at home a few times and finally settling on a couple of Apple “servers”, this seemed like a pretty good work-around that wouldn’t introduce much pain. The first caveat, however, was that I was unable to get Windows-based Salt minions to be accepted by OSX-based Salt masters. Not the end of the world, but it meant running Docker or a Vagrant box to handle the Windows 10 computers. 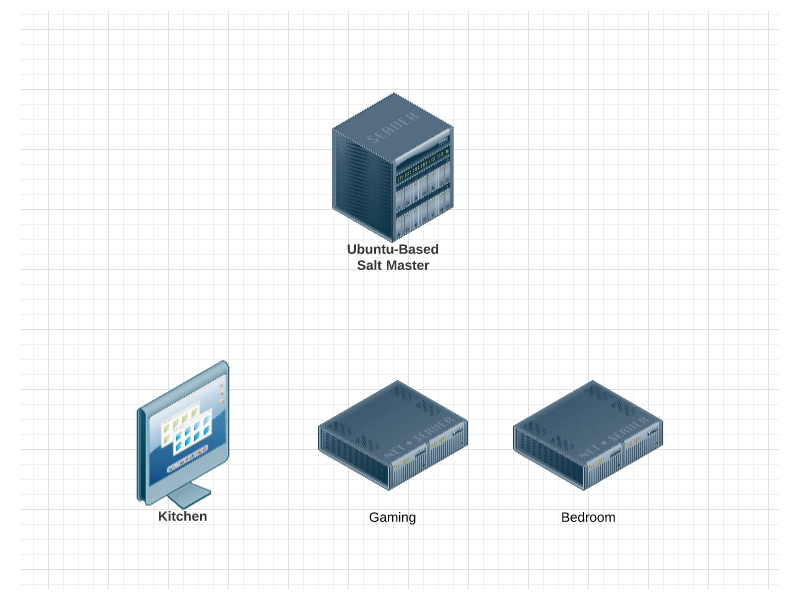 I ended up simply installing Salt on an Ubuntu-based storage server I already had running that had recently been upgraded to Xenial instead, but I’m most likely going to be revisiting this architecture in the long-term. I’ll come right out and say that I cheated when it came to installing the Minion service on the nodes at home in that I already had Chocolatey installed, and that I simply used the default salt hostname for the master by adding it the the static DNS entries on my DNS server. Should you have to go about this a different way, you can point an alias (CNAME) to the hostname in your network, OR add a manual host entry to your nodes (I’ve used Group Policy to do this in the past, with network scripts), or finally, you can simply change the Salt Minion config to point to the new hostname. This snippet will install the Salt Minion service, configure it to point at `SALTMASTER` (replace this with the hostname you’d prefer) then start the service. Note: as mentioned above, I haven’t tested this myself! The most up-to-date Salt Minion binaries can be found here: https://docs.saltstack.com/en/latest/topics/installation/windows.html Should the version change, you’ll want to update that one-liner as well. Assuming you’ve got your minions now sending requests to the Salt master node, you need to approve them. Key for minion WINDOWSGAMES accepted. Now that you have minions installed and working, let’s run a quick test that proves we can run remote commands on them. Note that this is just scratching the surface, and that “push commands” are just one way of working with Salt Stack, you can also have the nodes “pull” from the Salt master on a regular basis. 07/16/2016 04:47 AM <DIR> . 07/16/2016 04:47 AM <DIR> .. Personally, I’m currently using Chocolatey package management because it’s what I’m used to, but I certainly do still use Cygwin for development purposes from time-to-time since Windows Bash mode has still yet to become commonplace. The third option, however, is probably the most scalable, and more user-friendly. This means that you now have a repository for Windows packages on the Master node, but also note that these don’t come with binaries – they will fetch and send them as needed. I can see this as both good and bad, in a corporate setting you’ll want to create your own SLS files and point them to known-good sources. I’m trying to follow the “pets vs cattle” paradigm here, though you can also use -G to specify groups of servers/workstations/laptops which can overlap in order to manage things in a more granular approach (bit of a pun here, the G is for Grains). In no particular order, here’s a quick dump of the commands I used during my first weekend managing Salt minions at home running Windows 10. The (`) should be a (‘). I was getting weird errors after copying and pasting!